Rajasthan has almost always chosen between BJP and Congres in an alternate pattern. Will voters buck the trend or will an informal status quo prevail in the power swap here? Jaipur: The voters in Rajasthan on Friday decided which political party forms the next government. There has been no shortage of tall promises made with every major contesting party assuring the moon and the stars. But will BJP manage to ensure that Vasundhara Raje gets another term or will Congress roar back to power in a state that has mostly ensured a see-saw battle over the decades? In the fray were BSP and AAP as well but they are not expected to make much of a dent. For BJP, a number of national figures - including PM Narendra Modi and party chief Amit Shah - have extensively campaigned across the state. Listing out the achievements of the state and the central leadership, BJP has also targeted Congress on numerous fronts. The return fire has been quite scathing too with Rahul Gandhi, Sachin Pilot and Ashok Gehlot leading the charge. Will anti-incumbency spell BJP's downfall here? Will reports of in-fighting between Pilot and Gehlot, and not naming a CM candidate hurt chances of a Congress renaissance? 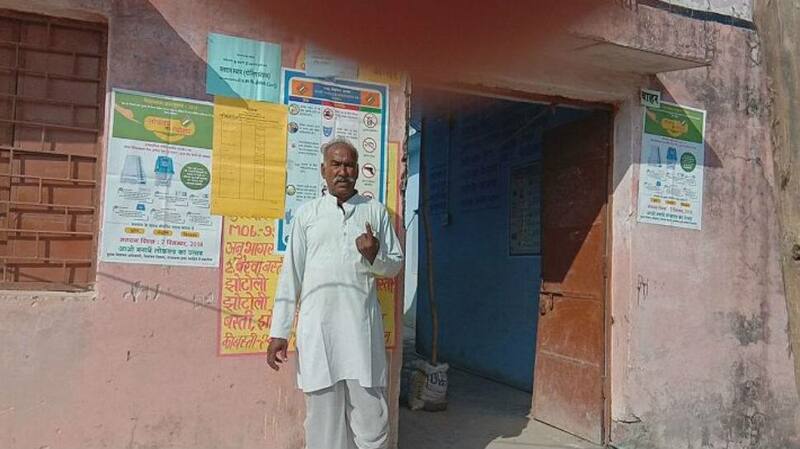 Voting concludes at Ratanada's Sardarpura constituency. Visuals from polling booth at Miranda Public School. Polling concludes at polling booth no. 31(A) in Rajasthan's Jhalawar. 73.83 per cent voter turnout recorded at this polling booth. 72.7% voter turnout recorded till 5 PM in Rajasthan. 59.43 per cent voter turnout recorded till 3 pm in Rajasthan. 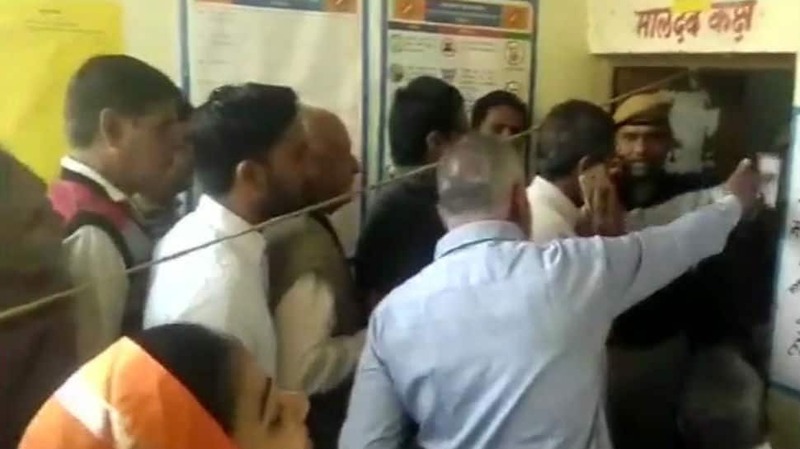 Violence erupted at a polling station at Subhash school in Sikar's Fatehpur. Vehicles were torched and property vandalised. 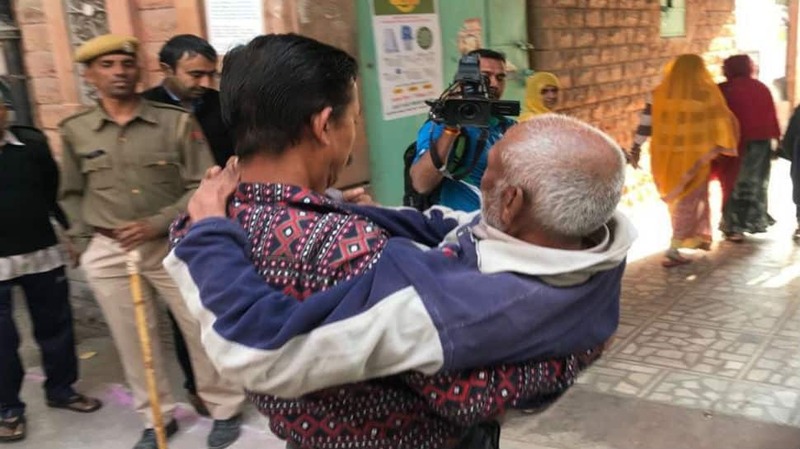 News agency ANI reports that the miscreants were removed from the area by cops even as voting remained suspended for 30 minutes. The reason for the violence is not yet known. 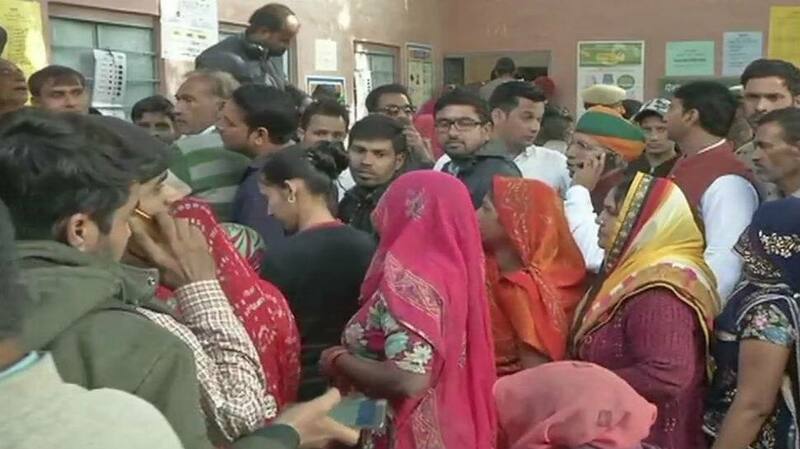 Rajasthan witnesses voter turnout recorded of 41.53 per cent till 1 PM. 22% voter turnout in the state till 1100hrs. Ajmer South, Nathdwara and Alwar Urban register 100% voting. 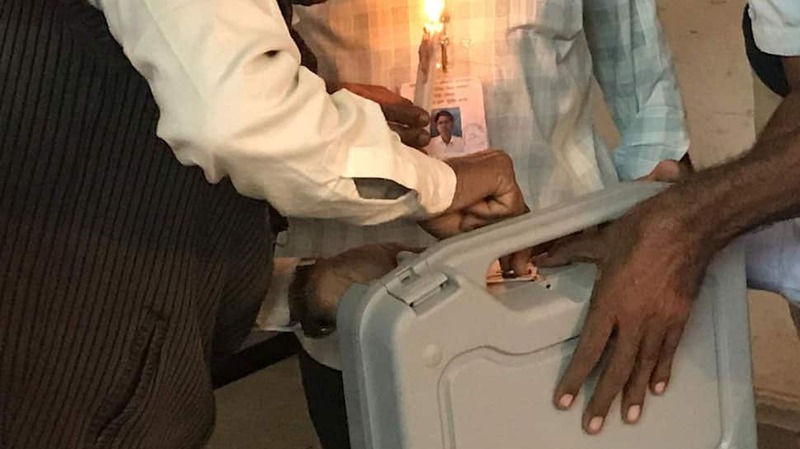 From Vasundhara Raje to Rajyavardhan Singh Rathore, Arjun Ram Meghwal and Congress' Gehlot, political leaders cutting across party lines have come out to cast their vote in the morning hours of polling. The curious case of just one vote! The village of Jhotali has seen just one vote in the first three hours since polling officially began. Zee News Rajasthan reports that villagers have decided not to cast their votes till their demands related to water are met. SDM and other officials are trying to convince villagers to cast their mandate. News agency ANI reports voters created ruckus at polling booth No. 253 and 254 in Ahor constituency of Jalore after EVM malfunction halted voting. Ashok Gehlot casts his vote at polling booth No. 106 in Jodhpur. Voter turnout till 9AM: 6.11%. News agency ANI reports of a 90-year-old man coming to vote in Sardarpura constituency of Jodhpur district. 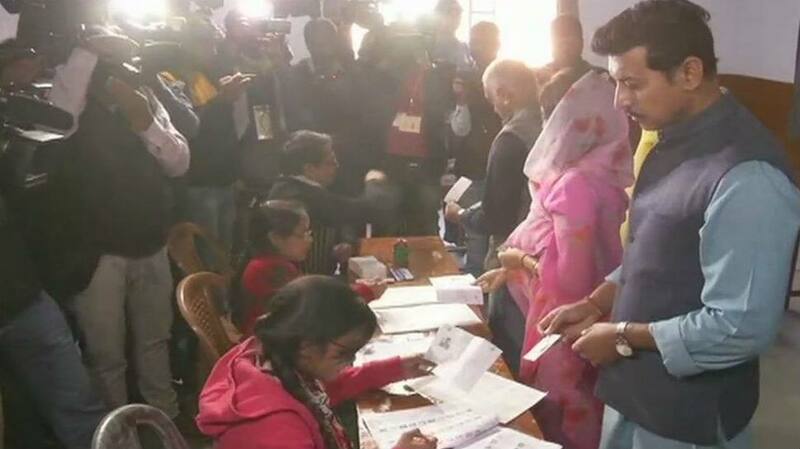 I&B minister Rajyavardhan Singh Rathore casts his vote. Vasundhara Raje arrives to cast her vote at a pink polling booth in Jhalarpatan. There are 200 such all-women polling booths in the state. Raje had won by a margin of over 60,000 in Jhalarpatan in 2013. "People will vote for the development work that we have done. I am confident that people of Rajasthan will strengthen the party which they know has development as its key focus area," she says after casting her vote. Voting could not start till 0815hrs despite voters forming long lines at Ajmer South's Booth No. 71. It is being reported that the polling officers were late in reaching the venue. Heavy security in international border areas of the state. Eight checkposts have been established while CCTV footage and physical search of every vehicle ensuring security. According to Zee News Rajasthan, polling booths in many parts of Jaipur are fixing troubles with EVMs and VVPATs. Civil Line, Kishanpol, Jhotwada, Chaksu have reported faulty EVMs. A great deal of enthusiasm among voters in the state with many lining up outside several polling booths much before the official start. Voting begins across the state! Besides Rajasthan, Telangana too is voting today. Click here for live and latest updates from the state. While BJP recorded its best performance ever in the state - winning 163 seats, while Congress crushed to its worst ever result here and managed only 21 seats. The incumbent CM at the time - Ashik Gehlot, managed to win from his constituency of Sardarpura while Vasundhara Raje won from Jhalarpatan. The BSP was confined to the sidelines and Mayawati's party secured wins in only three seats while Independents won another seven. Click here for full list of constituencies and candidates. The BJP has claimed that 94% of promises made to the people before the previous elections here have been fulfilled. In its manifesto for the 2018 elections - released by finance minister Arun Jaitley, the party has continued with assuring people that it cares for them. A promise of 30,000 new government jobs each year, 50 lakh employment opportunities in private sector in the next five years, new Rs 250-crore fund to encourage rural start-ups are some of the promises made in Rajasthan Gaurav Sankalp Patra. The Congress too has been a number of promises to the people of Rajasthan. Its manifesto for the state was released by state party chief Sachin Pilot and promises to bring in right to health, waive off farmer loans, provide free education to women, among others. The state has 4.74 crore voters - 2.47 crore males, 2.27 females. There are 51,796 polling stations across the state - a 14.25% rise from 2013 elections. Out of 200 seats, 34 reserved for SC, 25 for ST.
Voting to begin across the state from 0800hrs. It is expected to carry on till dusk.